Businesses across the United States are suffering from a talent shortage, and the problem is growing. As of May, there were 6.6 million unfilled jobs, a 17 percent increase in the last year. To resolve the problem, the White House launched an initiative to bring back vocational education in high schools. President Donald Trump signed an executive order on July 19 that creates a national council charged with developing a strategy to grow the workforce. 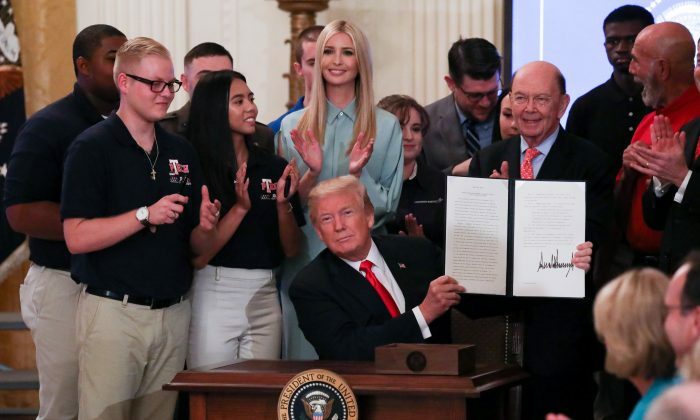 “Every day, we are lifting our forgotten Americans off the sidelines, out of the margins, and back into the workforce,” Trump said during the “Pledge to America’s Workers” event at the White House. The new National Council for the American Worker will be made up of top officials across the government. The council will work with the private sector and state and local governments to expand vocational education, career and technical training, and on-the-job training. The initiative focuses on training students as well as mid-to-late career workers. According to Ivanka Trump, nearly 1 in 5 Americans work in jobs that didn’t exist in 1980, and many of those are technology jobs. More than 20 U.S. companies and organizations joined the president at the White House, pledging to support the workforce initiative. The participating companies included FedEx, Home Depot, General Motors, IBM, Lockheed Martin, Microsoft, Northrop Grumman, UPS, and Walmart. The company executives signed a pledge to invest in workforce development by expanding apprenticeships and increasing on-the-job training. The companies pledged to provide training to at least 3.8 million American students and workers for new jobs and better careers. The biggest contribution is coming from Walmart. “We commit to train and develop over 1 million associates in the next five years,” said Julie Murphy, executive vice president of people at Walmart during the event. Marillyn Hewson, CEO of Lockheed Martin, who has long been an advocate for rebuilding the American workforce, said her company is promising to create 8,000 apprenticeship opportunities and invest $100 million on workforce development within the next five years. “In the years ahead, millions of American workers are in danger of being left behind by advances in digital technology, manufacturing, and automation,” Hewson wrote in an op-ed for Fox News. “In decades past, preparing U.S. workers for the future meant focusing on promoting science, technology, engineering, and math,” she stated, adding that Americans today need to go further and think more broadly. As part of the initiative, Trump is also creating an advisory board made up of company executives. “We’re also establishing an outside advisory board of industry leaders and experts, which we will announce in the coming weeks. Very shortly,” said Trump. Last year, Trump created the Apprenticeship Task Force and signed an executive order to ease the regulatory burden on apprenticeship programs. The administration also took action to increase access to Science, Technology, Engineering, and Mathematics (STEM) education for K-12 students. The president has also proposed to reform the Carl D. Perkins Career and Technical Education (CTE) program in order to provide skills-focused education to 11 million students and workers. The House unanimously passed an update to the Perkins Career and Technical Education bill, but the Senate hasn’t taken any action yet. U.S. job openings surged to record-high levels this year, with vacancies increasingly exceeding the number of unemployed workers. And the unemployment rate fell to record low levels. While a strong jobs market benefits American workers, companies are having trouble finding suitable workers due to a growing skills gap. The skills shortage is a broad issue that affects many U.S. industries and forms a threat to future economic growth. Hence the U.S. education system has to respond to the needs for current and future jobs. According to a World Economic Forum (WEF) 2016 report, 65 percent of children starting primary school today will eventually end up working in new types of jobs that don’t yet exist. “In many industries and countries, the most in-demand occupations or specialties did not exist 10 or even five years ago, and the pace of change is set to accelerate,” stated the WEF report.